This is our brand new pub table. 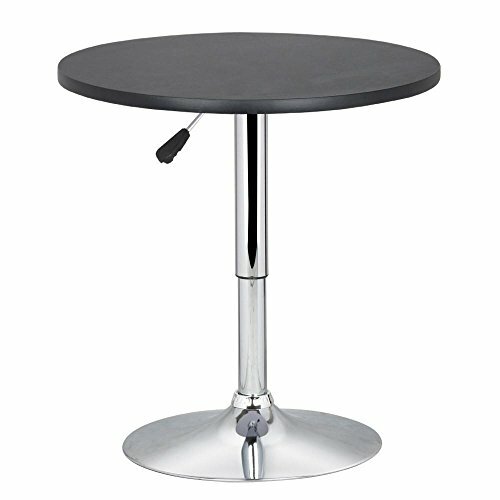 This round/square bar table can be used as a bar table or dinner table for two person. It features with 360° swivel design and adjustable height from counter height to bar height for extra comfort. Sleek E1 MDF tabletop is easy for cleaning. It is perfect no matter for pubs, bars, cafe or for restaurants. Package Size (Approx. ): 25.6 x 25.6 x 6.1"
1. Sir/Madam, you are advised not to put a very hot stuff directly on the table in case of desktop bubble. If you want to put a hot stuff on the table, please use it with a table mat together. 2. This product is not built with locking function. Great for the restaurant, home, bar, pub, coffee shop, kitchen etc.